You want your hair dark, yet you want your hair light. 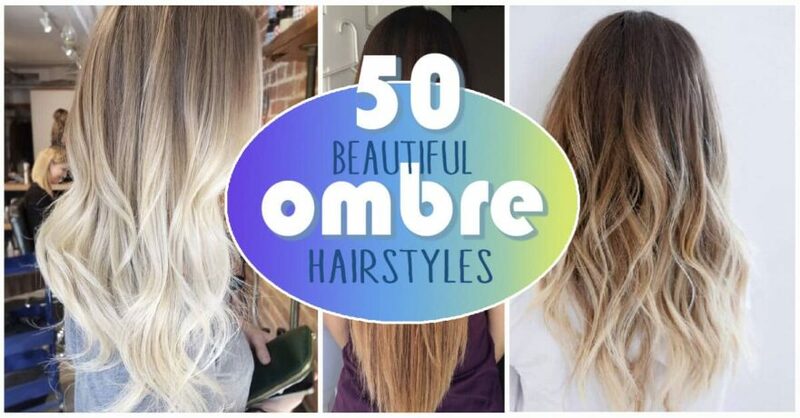 Before now, it was strange to have a mix of both, but ombre hair has provided the best of both worlds to hair stylists and colorists everywhere. Ombre is essentially a blending of darker and lighter dyes until they seamlessly blend together. If done correctly, the color looks more natural than other dyes, and it works great for summer, fall, spring, and winter. 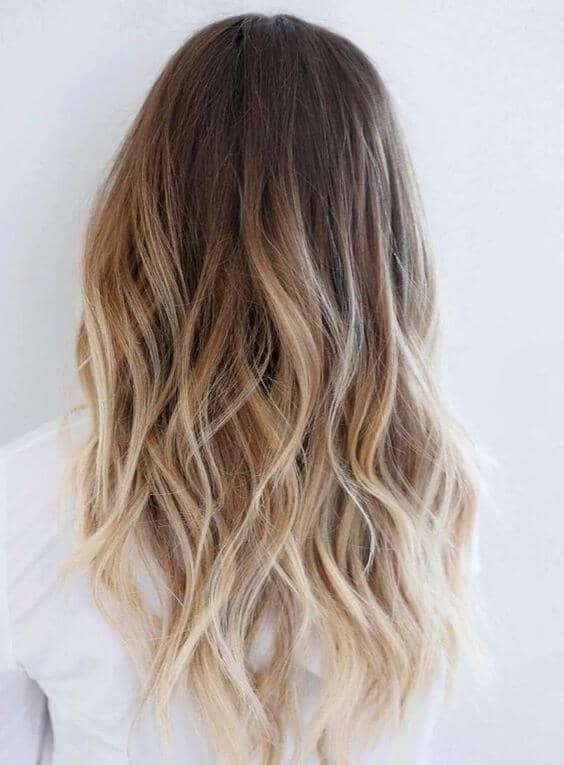 Ombre hair is a cute way to get the shades you want without having to risk a color not looking well with your skin tone or eye shade. From bronze to black to icy blonde, ombre hairstyle choices are ideal for transitional colors and all seasons of the year. 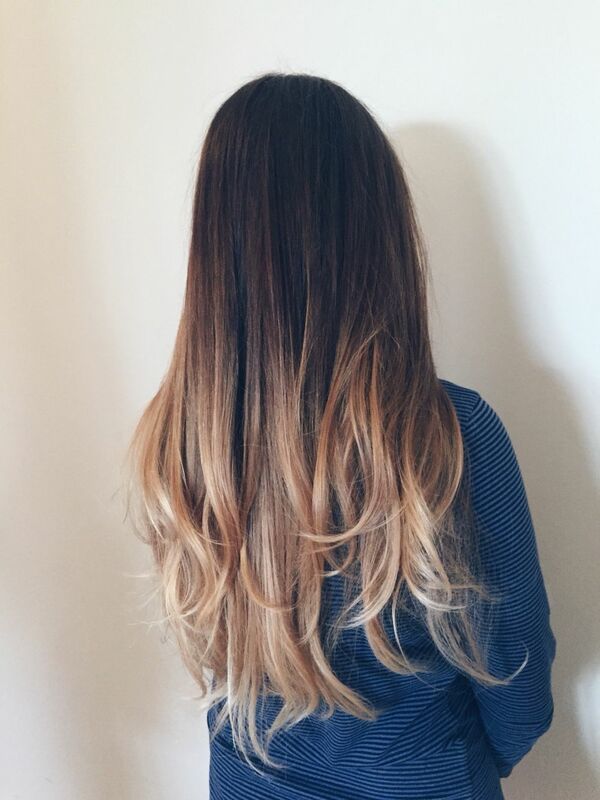 Who wouldn’t want to try out an ombre style? Some people can’t get to a salon to get the ombre hair of their dreams. Luckily, there are several ways you can get the same beautiful ombre hair look right at home. Learning how to do ombre hair at home is not as difficult as it seems, but there are few things to do before you slather on the dye. 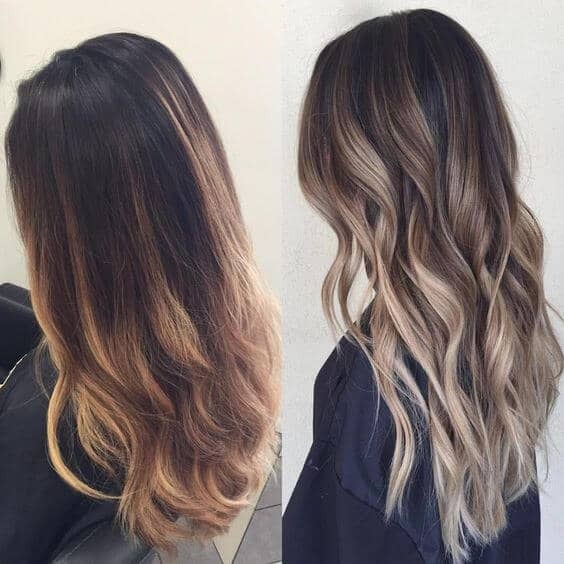 Before you start, you need to decide whether you want traditional ombre hair, with darker roots and lighter tips, or whether you want the reverse ombre, with lighter roots and darker tips. Next, you should choose the shades you want. Most people choose colors similar to their natural shade but in darker and lighter shades. 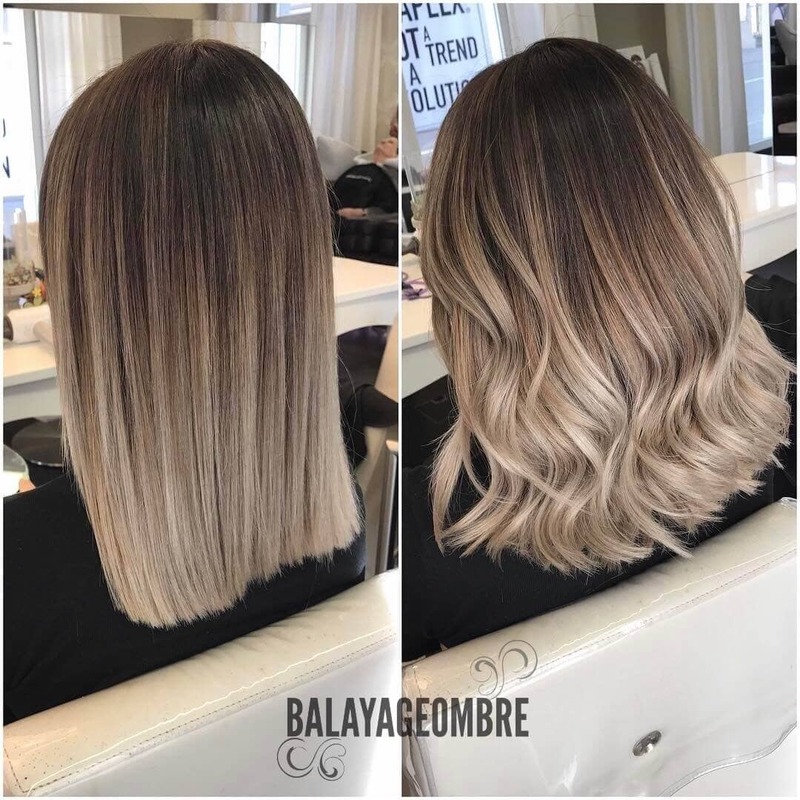 The more subtle of a color change you make, the more natural your ombre shade will look so many people suggest choosing shades that are only two or three shades away from your natural color. If you want to go bolder, make sure the dyes match well with your skin tone and eye color. The best way to putt off an ombre hair shade is to ensure that the colors you choose blend well with your skin tone. Otherwise, it will not look natural or as cute. You should then decide where you want your fading to begin. Most people choose lower fade since the higher the fading dye, the more it resembles grown out roots. Typically, the jawline is the ideal spot to start blending your shades. Other things to consider before starting with the color is to brush out your hair extremely well and put on an old t-shirt to prevent any damage to your favorite clothes. You should also wear gloves since hair dye tends to stain skin and nails very easily. If you are dyeing someone else’s hair, you should wear an apron over your shirt. Now, you’re going to mix up your shades. Following the directions is the best way to ensure that you mix up your color correctly. Depending on your hair length, you could need anywhere from thirty to forty volumes of developer for your look. Make sure your room is ventilated to avoid smelling the bleach for too long. Divide your hair, tease the hair to your fading point, and use an applicating brush to put the bleach on your hair, ensuring that you start in the same spot all around. Painting the shade down your hair will avoid a stark line, and saturation in even thicknesses around your hair is ideal for the best look. All you have to do is let the dye sit for the required processing time. Often this time will vary depending on the shade of your natural hair and the color in which you intend to change your hair too. Ten to fifteen minutes is ample time. 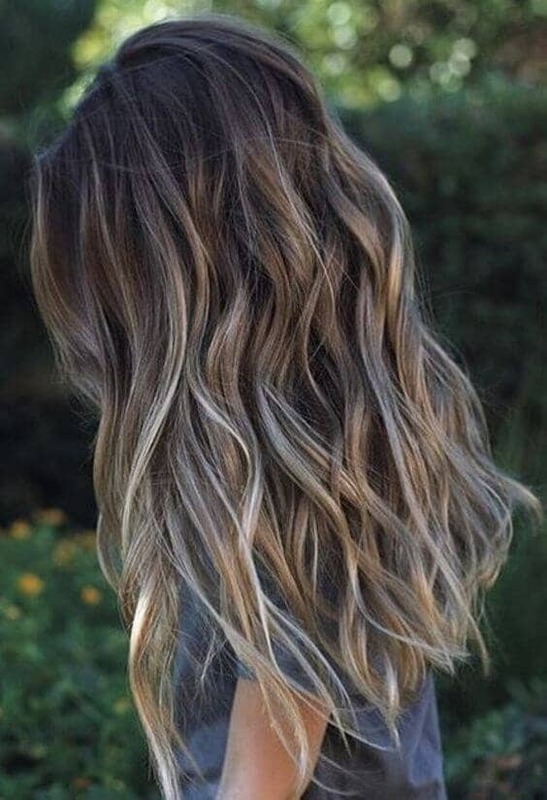 After you have checked your dye to see if it is perfect, you can rinse the color away, dry your hair, and style it to show off your new cute ombre hairstyle. If you want to go for a bolder look, like bright reds or pastel shades, you will want to complete the process again by adding the second dye over the bleached out spots. Starting with a luxurious dark root, this hair style has a beautiful blending into a soft blonde tip. 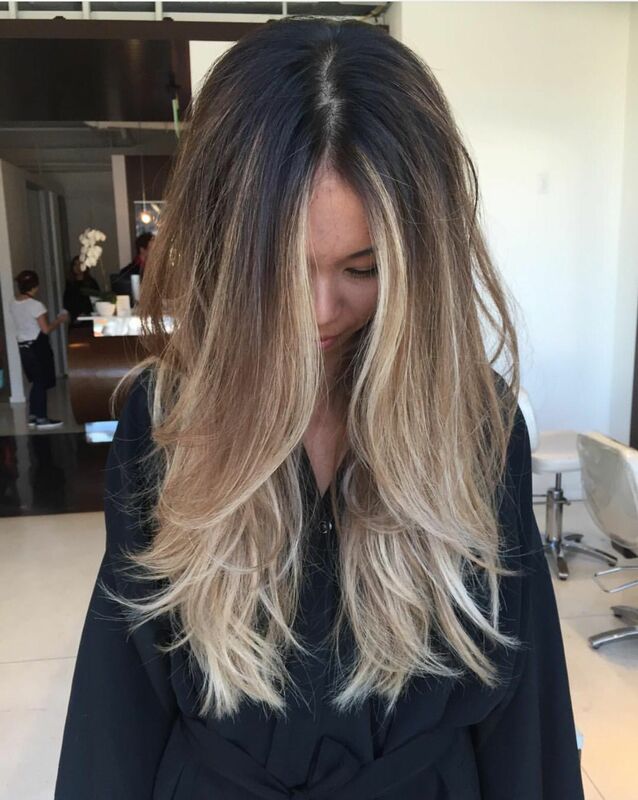 This look is one of the more traditional Ombre styles going from dark to light with a smooth transition in between. The dyes blend seamlessly for a natural look that can go from spring to summer to autumn to winter. This rich chocolate brown melts into a honey blonde, ideal for those with long hair. This look is more subtle than typical ombre styles. The roots are done with a rich, dark brown that transitions to a soft, honey blonde. 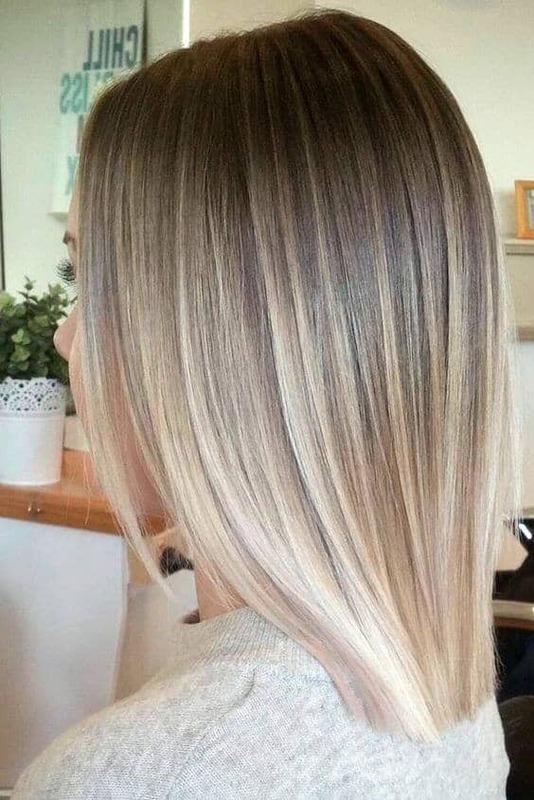 The colors are blended with the technique of highlights, which holds the same texture as ombre hair, but in smaller forms. The highlights break up the brown in small spots closer to the roots, while the bulk of the ombre begins to transition a little closer to the tips. This is ideal for long or short hair. Even natural red heads can enjoy the ombre look, and this fiery style shows everyone why. Starting with a light auburn at the roots, this ombre brightens into a fiery orange, auburn shade at the tips. In fact, it looks as if the sun has kissed this ombre dye style. The transition is completely seamless, and the bright look is perfect for summer or fall. This look is ideal for long or medium hair. Caramel is a great look for fall and winter. The rich shades bring a brightness to the drab seasons. In this look, the dark caramel base at the roots is slowly transitioned to a bright, caramel blonde at the tips. The transition is made with a few subtle ombre highlights before making the bulk of the seamless transition. The red tint in the caramel makes the hair look sunkissed, and the blonde looks flawless with the caramel. This look is great for long or short hair. Blends of reds, browns, and blondes, this look is one-of-a-kind. The roots are colored with dark caramel, Auburn, which has a slight purple-red tint. 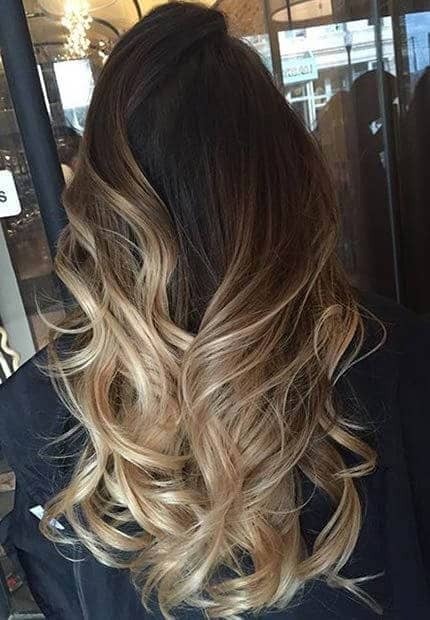 The ombre melts seamlessly into the honey and caramel blonde tips, making the hair appeared shaded. The dyes blend so well, in fact, that it looks as though an artist has painted the hair with a brush. This look is best for those with long hair to highlight the smooth and easy transition from the dark to the light. Blonde is a great color for spring and summer, and this ombre style has the perfect blonde look for these seasons. The light, ashy brown at the roots, blends flawlessly into the soft, icy blonde at the tips. There is a bit of honey blonde in the middle to give this ombre look a soft and elegant appearance. 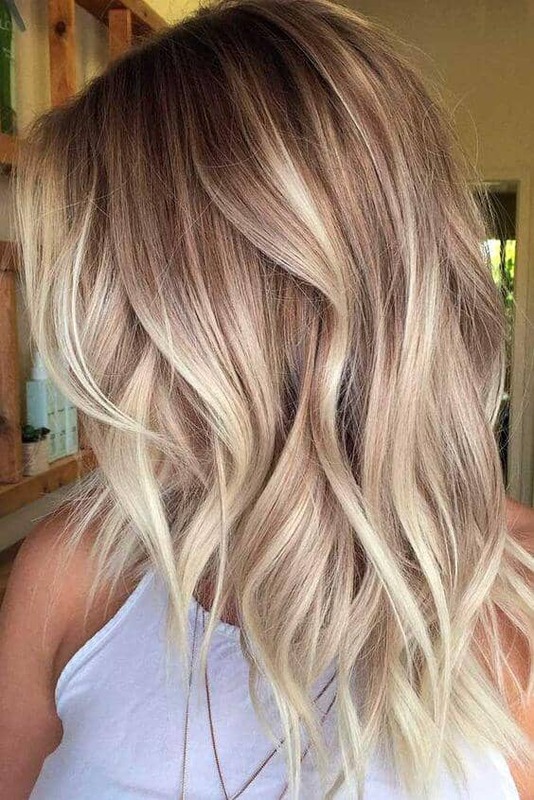 There are a few small ombre highlights that make this look unique, but the blonde and brown transition still looks natural enough to be pulled off by long or short haircuts. Ombre hair dyes on short hair can be a bit tricky, but this look is nothing but fierce. The dark, honey blonde sits at the roots, and makes its transition a bit higher on this haircut. It blends flawlessly by using highlights into a rich, chocolate brown that just seems to melt underneath the blonde color. 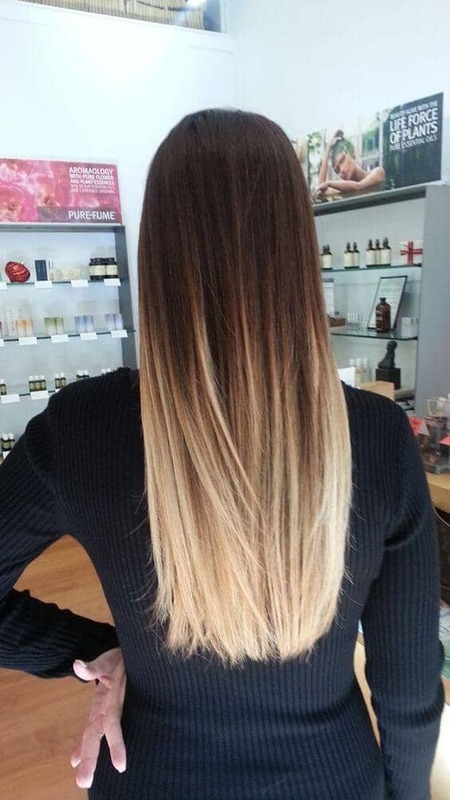 Since the hair is short, the transition is not as drastic, but the ombre is still visible from root to tip. This style is great for shorter hairstyles. Platinum is all the rage, and this ombre look brings the platinum in a more subtle approach. The dark, ash brown at the roots seems to drift slowly into a bright blonde until it reaches the platinum at the tips. The transition is smooth from the dark to the light, and with tiny highlights, there seems to be no beginning or ending to either dye. This look is great for short hair since the transition comes quickly. Natural blondes tend to have darker roots and lighter ends, even if they’ve never had color on their hair. 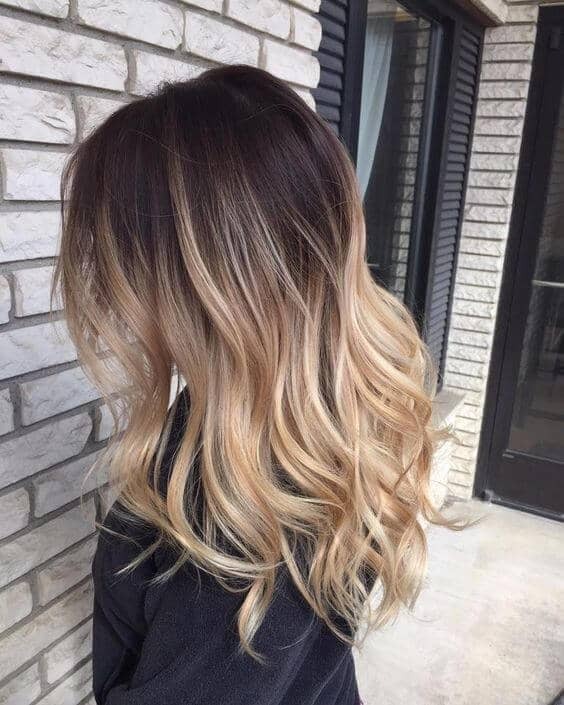 This ombre look achieves this same natural style by starting with a chocolate brown on the roots and blending into a nice strawberry/honey blonde shade. The blending takes places with very subtle and smooth highlights that look great straightened and curled. This hair style is ideal for long and medium hair cuts. This look simply screams summertime with the platinum blonde tips. 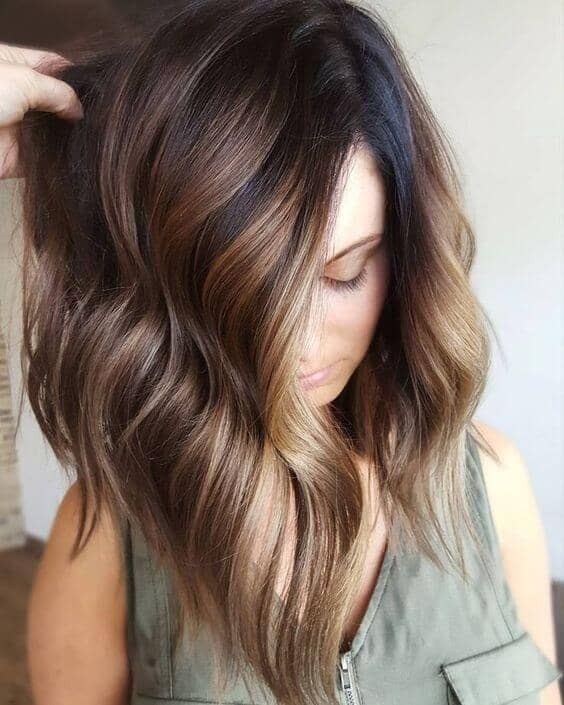 The root of this look, with its dark and chocolate brown shade, seems to bleed into the platinum, making it an ideal ombre style for summer. The transition is smooth with a light, ash brown in the mix, and the platinum blonde stands out. Natural and slightly sun-kissed, this look is ideal for longer hairstyles since the transition takes much longer than other styles. For a more subtle ombre look, this icy blonde is a great option. Softer and more subtle than traditional ombre, the dirty blonde roots blend seamlessly with the icy blonde tips. Though the look is subtle, it is elegant and striking at the same time. This look is great for spring, summer, winter, and fall since it looks more natural than some of the other ombre styles. Ideal for long hair, this ombre dye is stunning in all lights. Sometimes, ombre highlights are best when they frame the face. In this look, that is especially true. The dark, chocolate brown color at the roots, bleeds into a light, soft blonde at the tips. 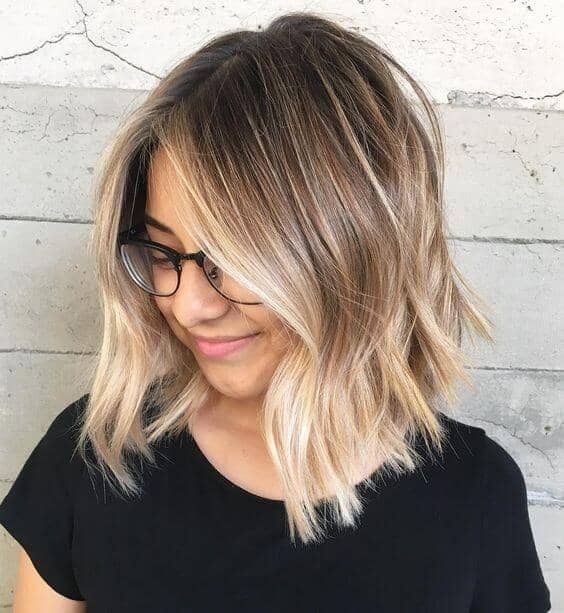 To make the transition easier, small highlights have been placed throughout, but the most striking feature of this look is the highlights around the face, pulling the blonde to the front. The ombre is more subtle in the front, making this look for long and short hair an edgy option. Elegance is sometimes the goal with ombre styles, and this look is no stranger to the concept. Blending dark ash brown with a light ash blonde in a smooth transition, this look is elegant and natural. The small highlights blend the two colors into a flawless transition. These two dyes, in ombre together, look amazing with curled hair and straightened hair. 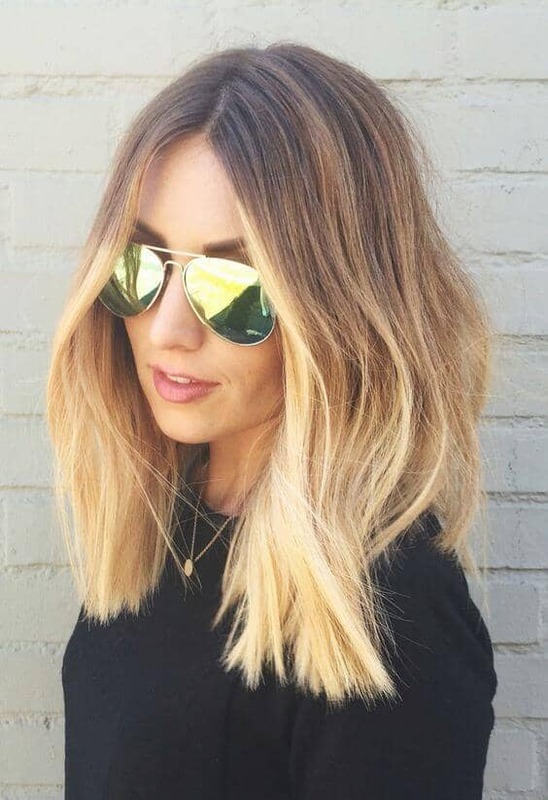 This look is also ideal for both long and medium styles since the transition is a bit longer than other ombre styles. For a shorter but more striking ombre look, this style has it all. Starting with a rich, dark brown shade, the color blends into an icy, platinum blonde at the tips in a short amount of space. The transition is smooth with a bit of dirty blonde in the mix. The look is striking and edgy while still pulling in that natural look that goes well with any season of the year. This look is ideal for short hair styles. 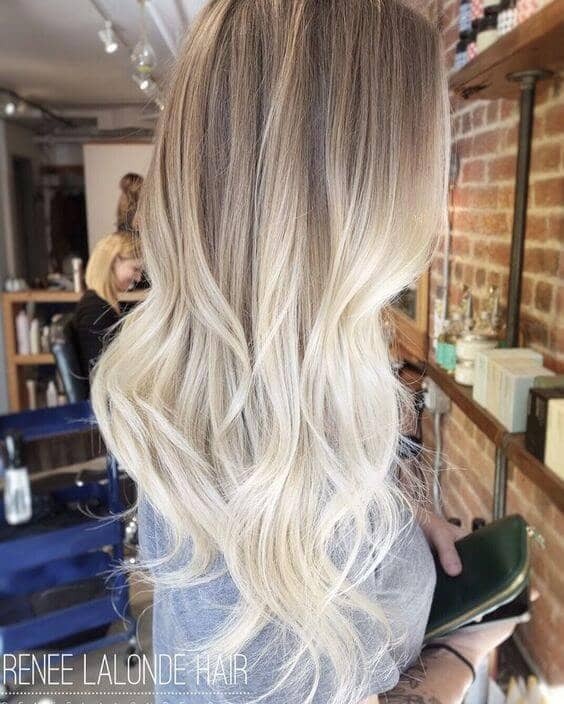 For the blonde beauties out there, this look is great for enhancing the natural blonde in a natural ombre style. 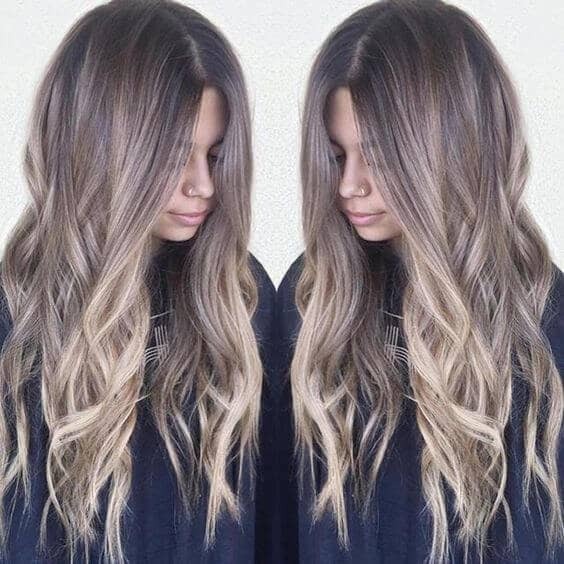 Starting with a light brown or dark blonde, the shade is seamlessly blended into a honey blonde until it gets to a soft light blonde at the tips. This look is great for all year round, and it is ideal for all hair lengths as well since it looks more natural. 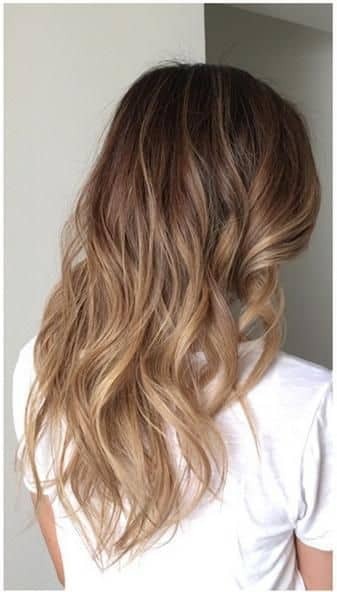 Long and subtle, this ombre look has a blend of browns, reds, and blonde that blend together to create a whirlwind of color. 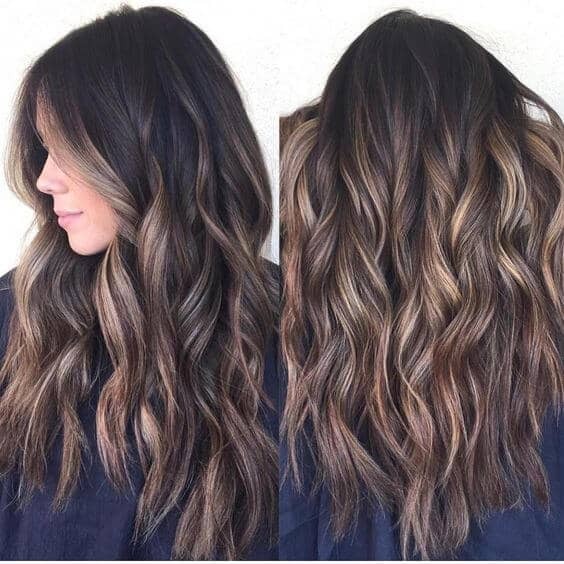 Starting with a rich, chocolate brown, the ombre transforms until it falls into a cascade of honey blonde tips. The transitions are seamless, and this look is great for fall and winter since the ombre is subtle and understated. Those with long hair can pull off this look easily because of the long transitions. 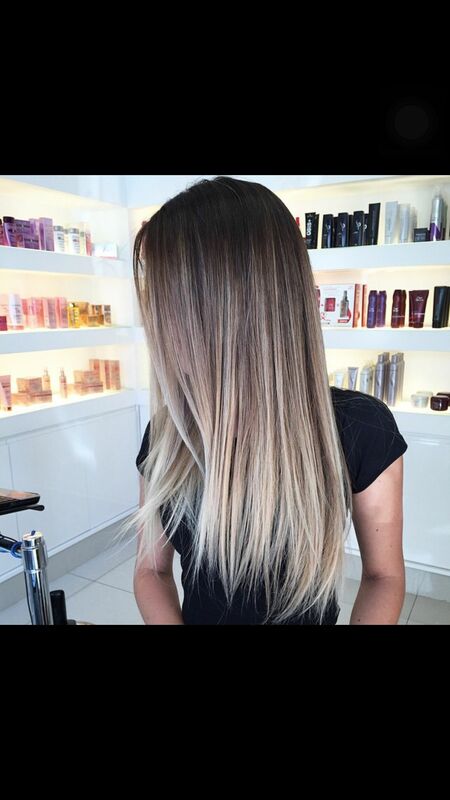 Striking and edgy, this ombre look is great for the blonde beauties out there. The tips are icy, platinum blonde with a blending of a dark ash brown to give the look texture. 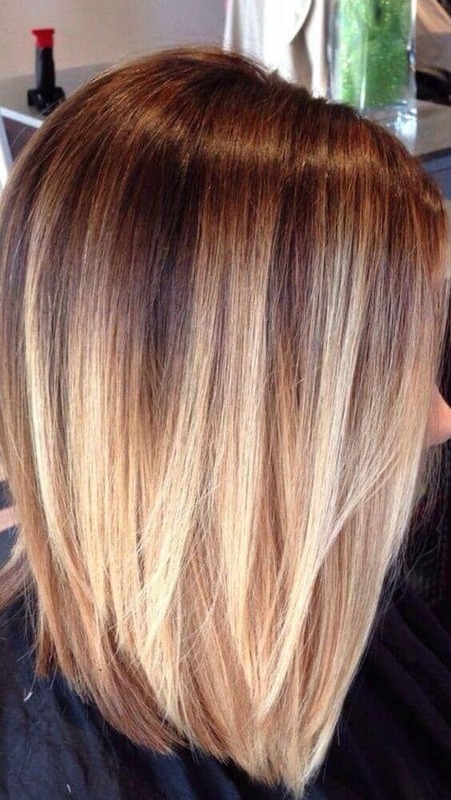 This is a great hair shade for summer and winter, and it even resembles a natural bright blonde look. Ideal for shorter hairstyles, the seamless transition starts higher up than most ombre styles, and the subtle ice blonde highlights provide dimension as well. This look will be giving off retro vibes throughout the winter time, and the colors are slightly sunkissed. Starting with a dark brown shade, this ombre look bleeds into an icy blonde at the tips. The caramel and honey blonde shades in between are just the perfect shades of summertime even in the cold months. This look is great for both short and long styles since the transitions can be altered according the hair length. Strawberry blonde is an ideal shade for the start of summer. 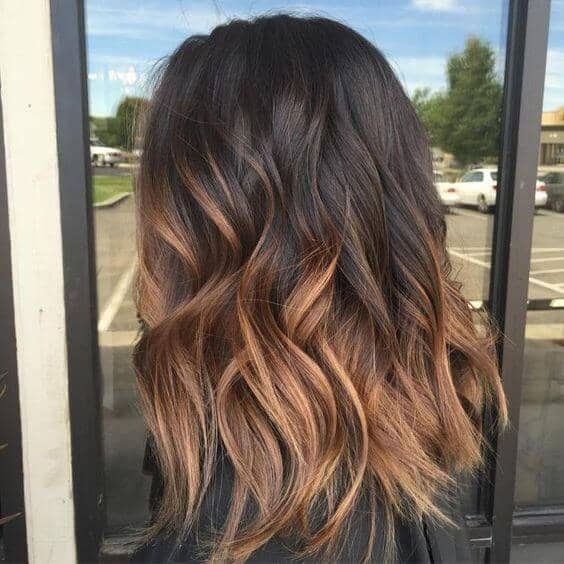 This ombre style is great for the start of summer since the dark auburn shades and blonde shades mix well together. This look is comprised of mostly blonde strands that blend well into the Auburn roots. The transition is seamless, and the subtle ombre highlights are great for blending the two colors together. This look gives off a brilliant and striking appearance. Starting with dark brown—almost black—roots, the transition moves flawlessly to a rich auburn shade before turning into a golden, honey blonde on the tips. Great for summertime, spring, fall, and winter, this ombre look is ideal for all seasons of the year. It is also a great way to grow out those roots. This hair color style looks best on medium and long haircuts. Copper shades are all the rage for the fall season. This look combines the coppery tones with the ombre style that everyone loves. The roots of this look are a dark auburn that transition to a coppery, honey blonde at the tips. The subtle highlights throughout the look create dimension, and the shiny copper tones are a great look for when the weather starts to turn colder. 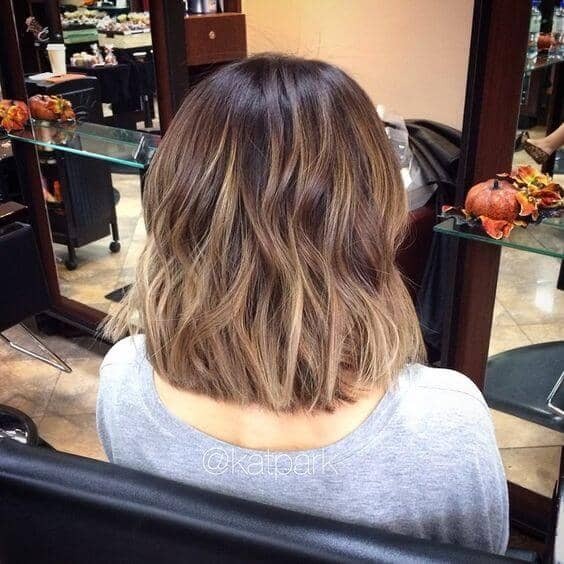 This ombre look is great for short hair cuts. The more gentle and subtle the transition, the more natural the ombre style looks. In this style, the subtle difference between the chocolate brown root color and the dark blonde tip shade is breathtaking. 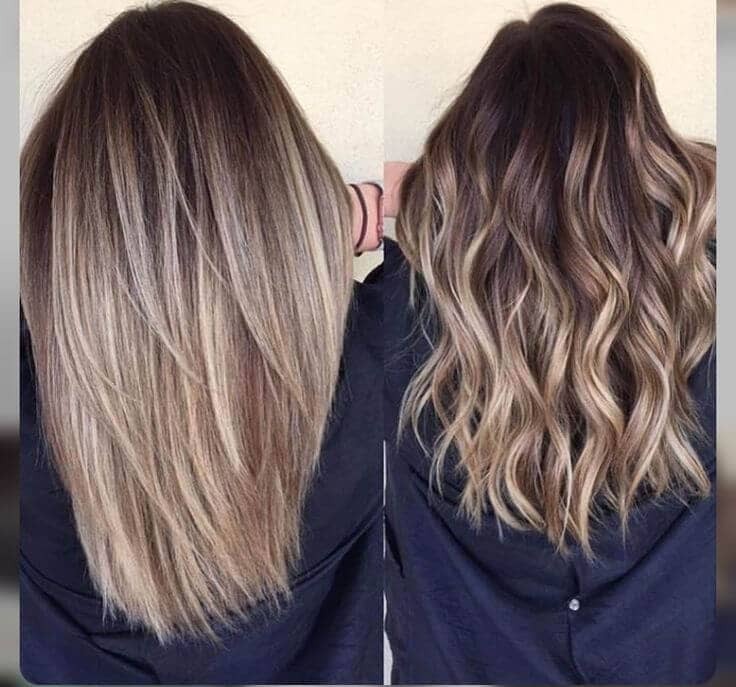 The natural look of this style is unique, and the highlights throughout the hair create a smooth transition and dimension. 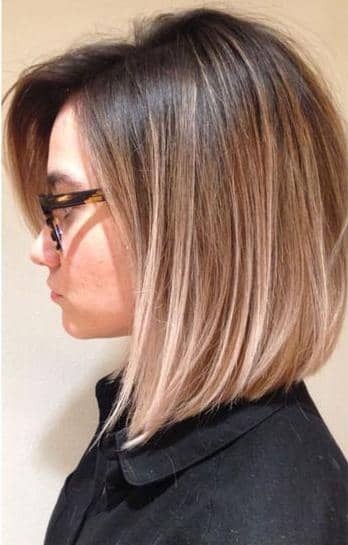 Those with short hair can pull off this ombre look easier than those with long hair because of the subtle change in color. 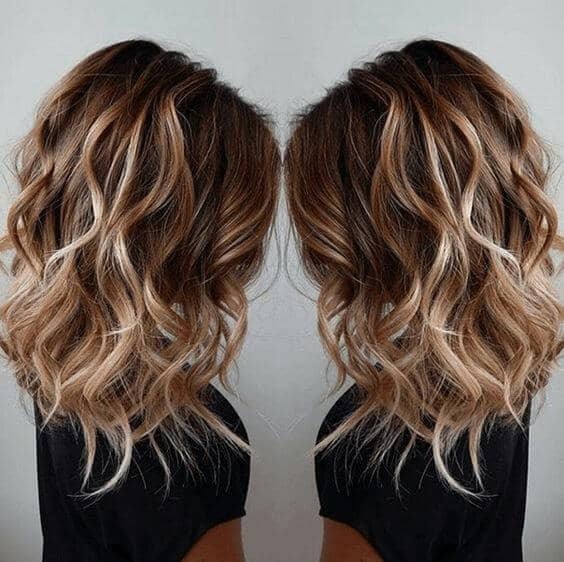 Curled or straightened, this ombre shade is ideal for those with short hair. The dark auburn roots are easy to blend into the dark, strawberry blonde tips. The blonde highlights throughout the dark hair, breaks up the single color to provide dimension to the look. The transition between the two copper and caramel tones is smooth, and this look is perfect for fall and winter. For a look that rivals the Ice Queen, this platinum ombre goes from a dark, ashy blonde to a bright, icy tone. 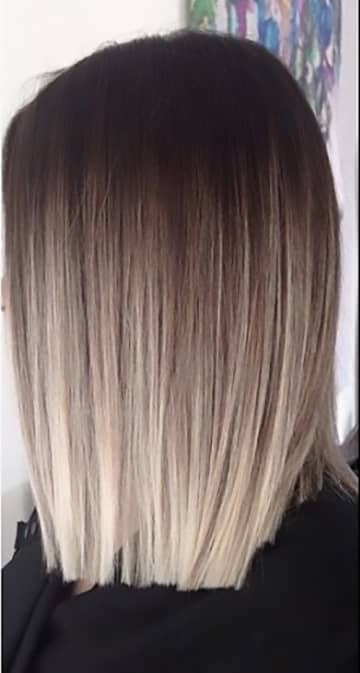 The platinum tips are great for anyone wanting to take their blonde to the next level, but the ash blonde at the roots provides a natural look for those wanting to keep it simple and subtle. The transition between the two shades is smooth and beautiful. This look is ideal for all hair cuts. This look is a little something for everyone since the colors range from black to honey blonde. Starting at the roots, this ombre style has a black tone that melts into a dark brown. It then transitions smoothly into a copper brown, before moving to a honey blonde on the tips. 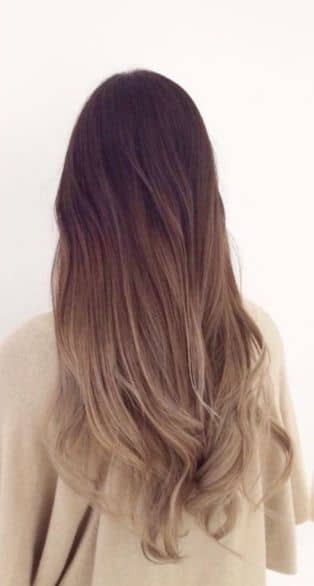 This ombre look is best for long hair since the shades need time to transition to get the full ombre effect, which is stunning. A drastic change from brown to blonde can be found in this look. Starting with a dark brown shade, this ombre makes a drastic transition to a copper blonde on the tips. Using small highlights, this look has an easy transition for such a drastic change. It is smooth, but beautiful. This look is great for all hair cuts since the transition is so short, and it is ideal for summertime. Great for short haircuts, this ombre style has a smooth transition and a fast one. The dark brown roots make a quick change to a copper brown before changing to a soft honey blonde. The transition is made possible by several tiny and subtle highlights all over. The ideal time for this haircut is anytime since it fits great with any season. It is also great for short haircuts because of the soft transition. Striking and edgy, this look gives off summertime and beach babe vibes. The look begins with platinum blonde tips that eventually transition into a copper brown at the roots. The transition is quick, with only a few inches of the brown showing. This ombre look is great for all hair lengths since the smooth transition is so short. It is great for summertime as well. 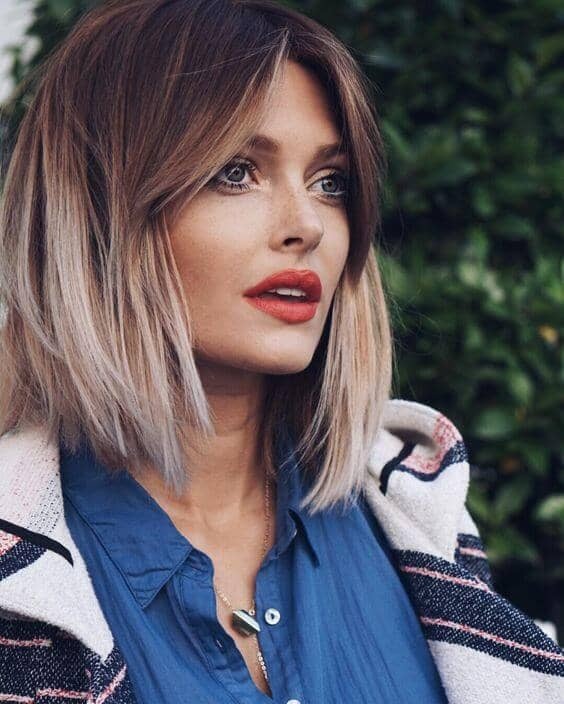 For those who don’t want a sharp ombre look, this hair color style might be the best option. The roots are a dark brown that remain the same shade until the shoulders where they finally begin to change. 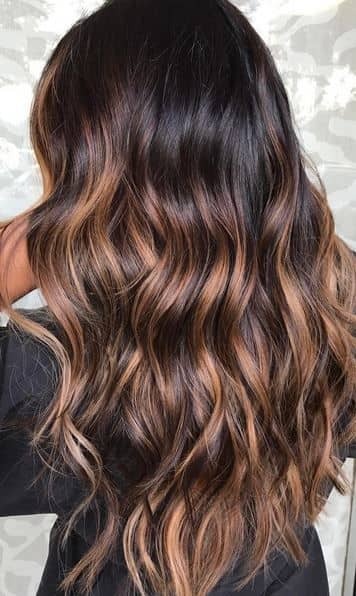 The tips of this ombre style are not far from the honey brown shade that the dark brown transitions too, making this ombre look natural and subtle with a low transition. This look is ideal for long haircuts. Summery styles are starting to come into style for all seasons. This blonde ombre look is best styled disheveled. It starts with a dark brown at the roots to resemble a “grown out” look. The grungy style is continued with a transition to a honey blonde before reaching a platinum destination. Subtle platinum highlights create a dynamic effect that looks great in all hair lengths, curled or straightened. Ashy colors are great for a subtle look no matter the length of the hair or the base shade. In this look, a dark, ash brown is used for the roots, blending in an ash gray and ash blonde mix for the tips. Small subtle highlights are throughout in an ombre fashion to provide a smooth transition and depth within the hair color. This look is great for wintertime or spring since it is soft and subtle. Stunning and fiery, this look is an edgy person’s heaven. The dark, chocolate brown covers the entire roots, but the tips of the hair are done in a copper brown that resembles the same shade as a penny. The transition is smooth by using gentle highlights to blend the dark and the light shades together. This ombre color is great for summertime and fall, and it is ideal for both long and short hairstyles. Even the ones with short haircuts can pull off a platinum ombre, especially if they adapt this simple look. The dark brown roots quickly transition into a smooth blending of copper brown and honey blonde until it reaches a small amount of platinum color at the tips. 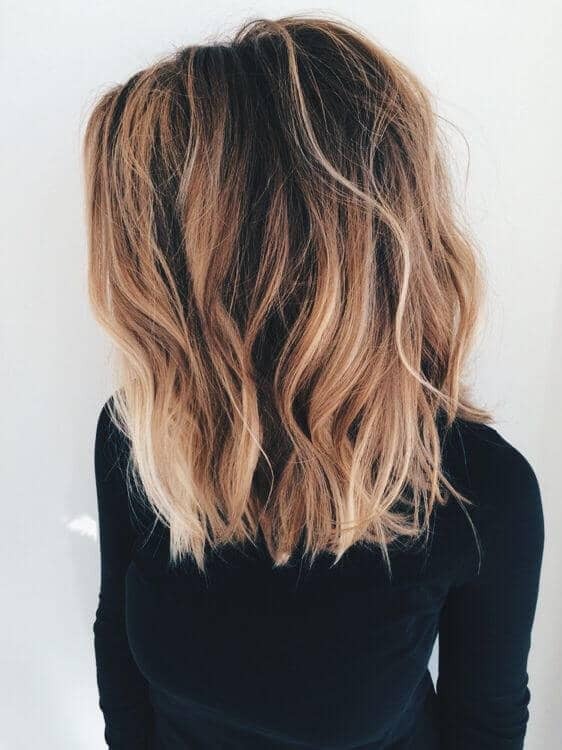 Those with short hair, medium hair, and long hair can pull off this ombre style, and it is great for every season as well. Those who prefer brown hair might enjoy this ombre look. Starting with a light brown/honey blonde shade at the tips, this hair shade transitions into a dark brown with an auburn tint. The transition is smooth without any harsh lines, and the colors seamlessly blend together like an artist’s painting. This look is ideal for any season because of the natural tones, and it looks best on medium to long hairstyles. Ombre styles that have a drastic change in shade are not always easy to pull off, but this look makes it seem so simple. Starting with a rich chocolate brown at the roots of this look, the color seems to bleed into a lighter shade of brown until hitting a light, honey blonde at the tips. This look is best for long haircuts since the transition needs to be longer to look more natural. It is stunning, edgy, and flawless all at the same time. One might think of this style as an icy look, but the subtle ombre highlights are almost frosted onto the dark ash brown base color. The tips of the hair are colored in this same platinum blonde that is used to transition the shades throughout the hair in highlights. This looks is great for summertime, and it can be adapted to all hair lengths as well. Dirty blonde sounds like a strange color, but in this color, it is nothing but strange. The dirty blonde tips blend flawlessly into the ash brown roots which shows an interesting contrast between dark and light. This look is perfect for both straight and curly hair as well since the transition is so smooth between shades. Those who have long hair might enjoy this interesting ombre style more, but it can be adapted to any hair length. Pair it with a suede jacket and bright orange lipstick, and this look brings a retro vibe to the floor. With a seamless transition between the dark, chocolate roots and the light, honey blonde tips, this look is second to none. Great for short styles as well as long, this look has a quick and easy transition between the two contrasting colors. The coppery tones are ideal for the fall season since they have a beautiful warmth in the tone. Edgy styles are in this season, which means anyone can learn to rock the edgier ombre styles. Made for long haircuts, this ombre style has a gentle transition from a dark brown to an icy blonde. The ash tones in the hair make it seem more subtle and natural, but the sharp contrast in the dark and light shades make it edgy in a certain way. This look is great for curly and straight hair as well, and it is ideal for all seasons of the year. This look is unique in its own way. The dark brown base color is broken up with a few copper highlights done in the ombre style. These highlights are based throughout the hair, but the tips of the hair have not changed from the base shade much. This ombre style is natural with a glimmering color and shiny wave. It is ideal for all hair lengths and all seasons. Not all ombre is bright and blonde. In fact, this shade is a darker take on a traditional ombre style. Mingling a dark brown with an auburn red, this coppery take on a brunette color is ideal for those who want ombre without sacrificing their dark natural hair. The transition is smoother than other ombre styles as well. This look is great for all season, but it best complements autumn with its rich and warm colors. Great for fall time, this ombre style is a mix of browns, dark and copper. Their tones are equally blended together to create a seamless transition from darker shades to lighter shades. The chocolate brown almost seems to melt into the copper brown, which also has highlights scattered throughout to further blend the two shades. 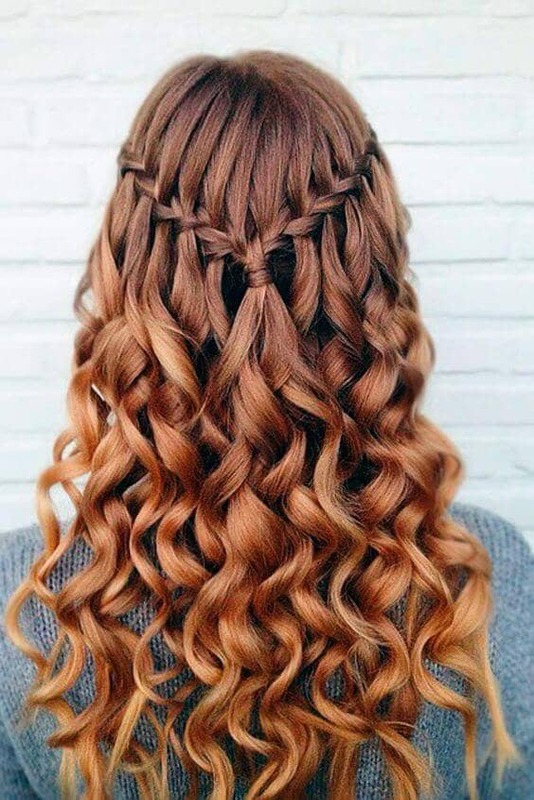 This style is great for curled hair, and it works best for long and medium style cuts. 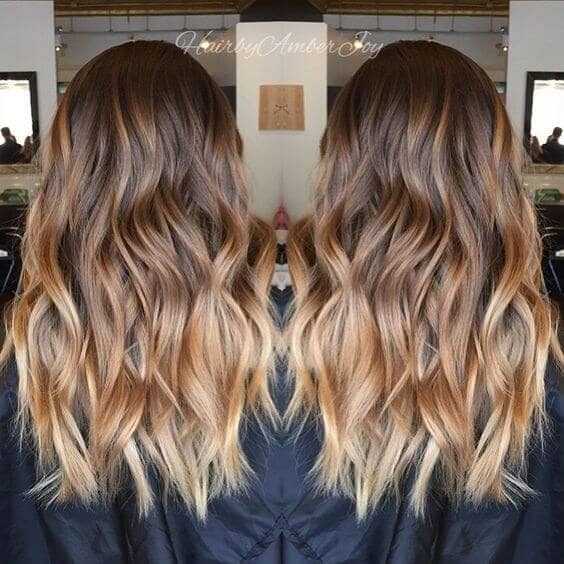 While on the subject of darker ombre, this hairstyle is a great option for those wanting subtle hints of blonde. Dark brown is the subject of the roots of this style, and a few light brown shades blend together to create the seamless transition to the ombre style everyone covets. Scattered throughout the look are honey blonde highlights that break up the monotony of browns to bring dimension to this hairstyle, which is great for all hair lengths and all seasons. 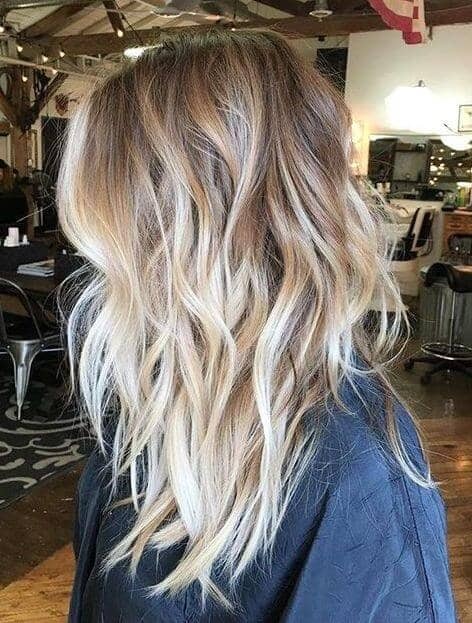 Some people don’t want to rush into the ombre game, and ombre highlights are the best way to ease into the interesting hair style. This look utilizes these ombre highlights in a platinum shade. They break up the dark, ash brown base color that is seen throughout the hair. The highlights travel all the way to the tips, getting slightly lighter as they go. This look is ideal for all hair lengths, and it is a great way to grow out roots while still looking put together. This looks is a subtle change from an ash brown to an icy, platinum blonde. The shades blend together seamlessly in a transition that is uncanny. The brown slowly grows lighter from the roots until it reaches the tips of the hair in a platinum shade. The transition is also quick, making this hair color ideal for short haircuts as well as long and medium styles. 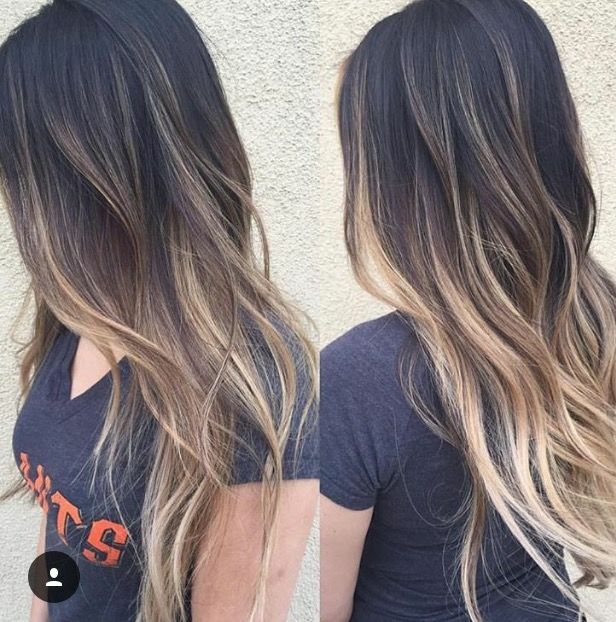 This ombre look is also great for all seasons since it is a more natural look. 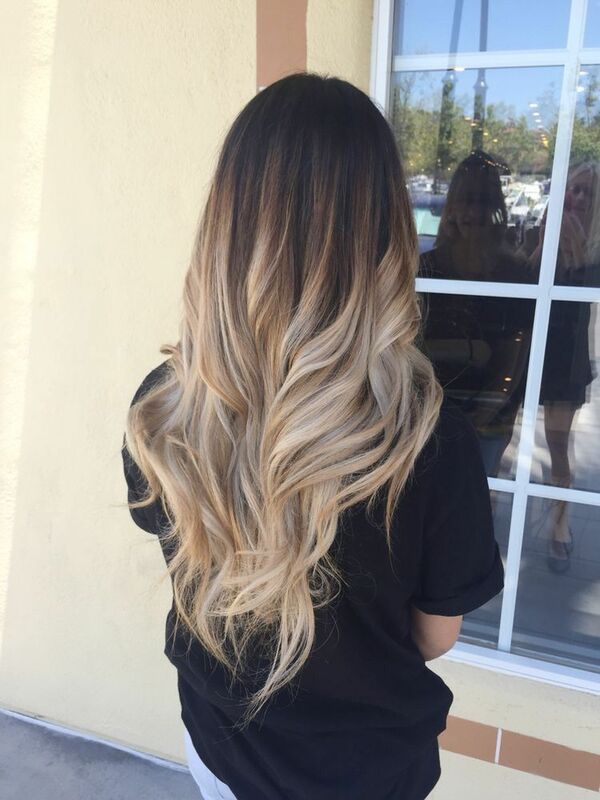 Even blondes can be edgy with an ombre look like this one. The dark blonde at the roots blends into a bright honey blonde at the tips. Sun kissed and great for summertime, this look is ideal for the summer vibes all year round. This look also includes bright honey, blonde highlights that frame the face for a bolder, edgier look. Great for long, medium, and short hair, this look is best when curled slightly for a beachy wave. In the past, hair shade was a way to show off an edgier look without straying much from their natural color. In the modern, ombre styles, this retro look is achieved by contrasting dark and light shades in a seamless blend. This look achieves this style by starting with dark, chocolate roots that bleed quickly into a bright honey blonde at the tips. The face-framing highlights are also great for bringing the rock, grunge look into play. This style is also great for short hair because of the quick transition. Honey blonde is a great light color to transition from a chocolate brown. In this look, the transition is quick since the hair is cut short. With a few gentle honey blonde highlights, the transition between dark and light is seamless and smooth. One can hardly tell there is a difference. This look is great for all seasons and all hair lengths as well. Copper shades on long hair is ideal for a summertime style. This ombre look is achieved by having a copper brown root that blends naturally and smoothly into a bright honey blonde at the tips. The copper shades mix well together, and they look amazing when curled and styled. Ideal for long hair, this look can be enhanced with a few face-framing highlights. 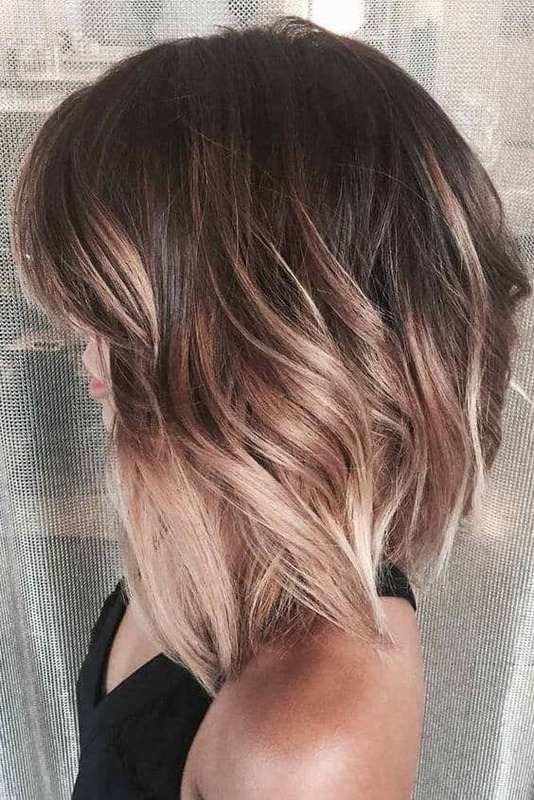 To get a sunkissed look, this ombre style blends a copper brown with a platinum blonde, giving the wearer something interesting and unique all year round. The look is achieved by starting with a dark brown root that slowly transitions to a lighter blonde. This ombre look is great for summertime, as well as the rest of the seasons. It is also best when done on long haircuts since the transition takes longer to appear more natural. 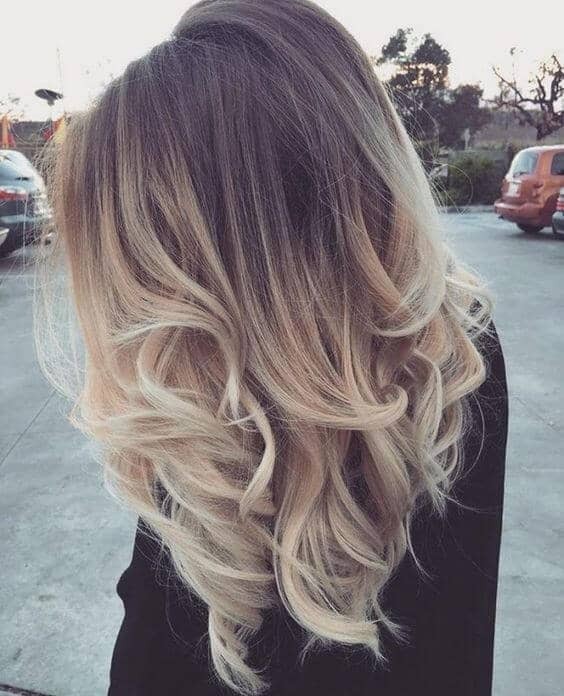 For a stylish look that is unique to your style, ombre hair colors and styles are the best choices for getting a new and exciting look that fits all seasons. From reds to browns to blondes, this style can be just as creative and unique as you are, and it is easy to achieve at home. By following the easy directions, you can achieve this hairstyle at home without having to take a trip to the salon. Finding your ombre style is easy as well. You can opt for natural looks, or you can go bold with bright blondes and reds. Whatever your style is, an ombre look is great for having the best of both worlds no matter the season!